Getting the month off to a start with a whole lotta alliteration there in that title. 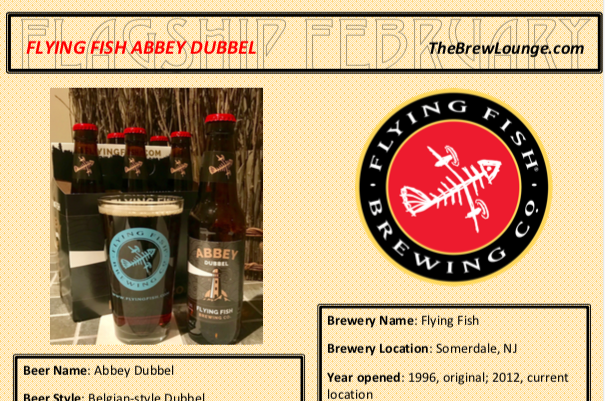 Today's featured Flagship Beer of February is Flying Fish Abbey Dubbel. It comes from the brewing team behind New Jersey's brewery that started out on the WWW in 1995 and began brewing in 1996. The brewery has always been eco-conscious and a recent note from Lou Romano (president) and Kirk LaVecchia (sales) pointed out the current efforts: "We are the 18th largest brewery producer of solar energy 463 solar panels, we have rain gardens on-site to prevent erosion, we recapture steam in the brewing process and have an upcycle spent grain program with local farmers." Now click the picture below for a full feature on Flying Fish Abbey Dubbel. Disclosure: For this project, I solely created the list of 28 beers featured here on The Brew Lounge. I was in contact with each brewery and neither required nor requested complimentary samples. I purchased today's Flying Fish beer at retail.